"Stranded in Petaluma over Labor Day Holiday! Visiting from Truckee. Chris was so reassuring. Gave me the facts, didn't fix something and not fix it. Got me back on the road. Thank you!!!!!" 5 star review by Chris S.
Chuck and Patty Robfogel first met in college, where Chuck was studying Automotive Technology and Patty was studying Business Management and Accounting. After going separate ways for a few years after college, they reunited once again in 1977, started dating, and were married in 1980. 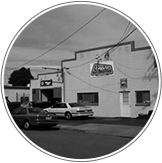 Patty, working at Hewlett Packard as a Management Information Analyst, and Chuck, a technician at local Chevrolet/Cadillac/GMC dealership, decided they wanted to open their own family owned and operated business, and, in May of 1983, Empire Automotive was created! In the beginning, Chuck worked at Empire Automotive during the day as Patty continued her day job at Hewlett Packard (Agilent) and handled the shop’s bookwork at night. 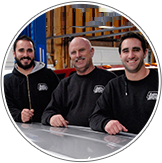 While Empire Automotive continued to grow, Patty and Chuck had 2 sons along the way, Nicholas and Christopher. As the business at Empire started to increase, Chuck and Patty hired additional staff until they got to their present crew. 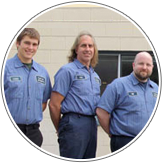 Now, Empire Automotive has 3 ASE Certified Master Technicians and 1 Apprentice Technician, 2 office staff members and one part-time bookkeeper. Chris, their youngest son, joined the team as Service Manager after graduating San Diego State College with a degree in Business Management in June 2010. Chris is working to soon begin leading the family business. When Chuck and Patty aren’t running the shop, they are water skiing, horseback riding, and love spending time at their getaway cabin in Lakeport on Clear Lake. Chuck also has always loved racing- cars, boats, and anything else that has a motor! Up until last year, they enjoyed drag racing! Their main concentration is on the shop, but together, they are hoping to resume their favorite pastime again very soon! Empire Automotive takes pride in having a wonderful customer base, and really tries to show their appreciation and interest in servicing all the needs to their customers! We use high-tech diagnostic equipment to guarantee your vehicle is repaired and/or serviced correctly the first time around, and we only use the highest quality replacement parts, filters, oils, and components when it comes to your car. Whether your vehicles needs an oil change, tire rotation, or factory scheduled maintenance, our technicians can handle all of your automotive needs. In fact, we back every service with a nationwide 24 month/24,000 mile warranty through NAPA, so you can have peace of mind knowing your car is in good hands at Empire Automotive. To keep your vehicle running properly at all times, Empire Automotive offers a number of services in the Petaluma, CA area, done by our ASE Certified, expert auto service and repair technicians, who have years of experience performing everything from oil changes to a complete engine overhaul. We proudly service all makes and models of cars, trucks, and SUVS, so you can bring all of your family vehicles to our shop. Our technicians stay up-to-date on the latest automotive technology to continue providing you and your vehicle with high quality service.